Let’s look at a few more challenges you may face when deciding whether something should stay or go. The challenges I describe, and the reasoning behind them, are all based on examples I have seen while working as a professional organizer and discussions I’ve had with clients. Mrs. Zimmerman said, “I don’t want this thing, and I don’t intend to ever use it again, but I don’t want to get rid of it because I don’t want it to go to waste.” Hmmm. “Don’t want it to go to waste…..” I believe waste is when something’s not being used to its full potential. If you’re storing something that you’re not going to use, it’s effectively being wasted. Not only is the item itself being wasted, but the space it takes up is being wasted, the time and energy you spend moving and cleaning it is being wasted, and the time you spend looking around it to try and find something else is being wasted. Furthermore, it’s possible that someone else out there is looking for an item just like yours right now. If you keep yours, unused, in the back of your garage, then that person is going to have to go out and buy a new one, therefore causing energy and resources to be unnecessarily wasted in its production. If you keep something you’re not going to use, it’s effectively wasted. If you throw in the garbage, it’s wasted also. The best way to ensure that the item is not wasted is to get it into the hands of someone who can use it. Ways to do that include donating, to Salvation Army, Goodwill, schools, reuse organizations, other charities, or friends. It could also include selling the item at a yard sale, on eBay, or on craigslist. Or it could include giving the item away on FreeCycle or on craigslist. I will devote a future post to the best ways to get unneeded stuff into the hands of people who can use it. Until then, you can use the extensive list of resources on our website. Occasionally, I’ve noticed someone may hesitate to let something go because of some kind of an unrealistic notion of value. Let’s look at two different ways this might show up. Well, you know, there will be times when we realize that an investment we made didn’t pay off the way we had hoped. With the financial crisis, there’s been a lot of talk of “toxic assets.” A toxic asset is something that is worth less now than what you paid for it. Well, maybe this old camera has become a toxic asset! If you’ve ever said, “hey I paid good money for that!” You may be evaluating an object based on its past value, rather than its present value. If something is not important in your life, the fact that you paid a lot of money for it doesn’t change the fact that it’s not important in your life. The investment you made in the acquisition has already taken place. The question is do you want to keep investing time, energy, and money in this object to store it and maintain it, when you’re not getting any benefit from it? There’s a difference between the market value of an object and how it fits into your life. This may sound shocking, but I contend that the market value and what you paid for it are irrelevant to the question of whether it should stay or go. The only thing that matters is how valuable the item is to you, how much benefit you get from it, how it supports what’s important in your life. So when you’re deciding whether something should stay or go, make that decision based on its value to you personally, rather than its market value. After you do decide to let something go, then you can of course use the market value to decide HOW to let it go. Based on an item’s market value, you may make different decisions about whether to donate it to a charity, give it to a friend, or try to sell it. In your collection of possessions, there may be objects that are broken, that you intend to fix some day. This is an example of what I call a project, something in which you must invest time, effort, money, or all of these before you can get any benefit from it. It’s been my experience that most people have more projects on the back burner than they will ever actually do. Therefore, the same way we make decisions about which belongings to keep and which to let go, we also need to make decisions about which projects to hold onto and which to let go. If there are other activities in your life that are more important than fixing this lamp, then every minute you spend on the lamp is less time you have available for those other, more important parts of your life. Also, when you consider a project, is a passion, or an obligation? Is it something that you feel excited about doing, or do you feel it’s something you should do? Please, be particularly careful about the obligations, about those projects you don’t really want to do, but feel you should. It’s been said that if you have too many “shoulds,” you start to live in a “shouddy” world. Please take care to “should” on yourself as little as possible. It’s been my experience that projects that are obligations never get done, because there’s always something more important or more enjoyable to do. So I suggest you take stock of all your projects and eliminate any that are “shoulds.” Then, for all the projects that you really do want to do, let go of all but the top three. After all, if these projects really were that important to you, you would’ve already done them. Let’s first take a look at what this phrase means, and the types of objects we apply it to. I’ve never heard this phrase applied to things we use on a regular basis. I wouldn’t say “I might use it someday” about my car or my computer because I use them both often. When you say, “I might use it someday” you’re most likely talking about something you have used rarely, if ever, in the past and will use rarely, if ever, in the future. There are two key words in this phrase, “might,” and “someday.” Let’s look at each one individually. First, “might” indicates that the likelihood of using the item is far from certain. It’s possible that it will be used, but it’s probably just as likely it won’t be. Second, it’s been said that “someday never comes,” but even if “someday” does come, it’s uncertain how far into the future it will be when this happens. “Might” and “someday” are two types of uncertainty compounded upon each other. When someone keeps one item because they might use it someday, it’s very unlikely that this is the only item they are keeping for this reason. It’s far more likely the rationale is applied throughout their lives and with many different possessions. It’s been my experience that if you keep one item because you might use it someday, you end up keeping a whole bunch of stuff because you might use it someday. Therefore, the phrase, “I might use it someday,” is a very dangerous phrase. It’s dangerous simply because it’s possible to fill up three houses and seven storage units with stuff you might use someday. So please, please, please, pay special attention to any time you use the ‘M’ word in the same sentence with the ‘S’ word. •	Clothes that don’t currently fit. You might be keeping clothes that are too small in case you lose weight in the future. •	An extra blender or two, in case the one you currently use breaks. So for Jerry, the junk mail represents a resource, an opportunity. It’s important to know, however, that this is not the only resource at his disposal. For example, I can think of a bunch of possibilities for what Jerry can do if he does ever need a gardener. 1. He can ask friends and neighbors who have used gardeners for a recommendation of someone they’ve had good experiences with. 2. He can find a gardener who is Diamond Certified. 3. He can do an Internet search for gardeners in his area. 4. He can get a recommendation from the local Better Business Bureau. 5. He can get reviews from websites that offer reviews like yelp.com or Angie’s List. 6. Or, he can look through his boxes for a gardener who did a bulk mailing five years ago. The company may no longer be in business, their contact information may have changed, or they may have a reputation for doing poor-quality work, but Jerry wouldn’t know that from this piece of junk mail. Of all these possibilities, which presents the best opportunity? Which is the most empowering? Which is most likely to yield the best results? Of the six options, number six, the one that Jerry is doing, is not only the least effective, but also the one that takes the most space and the most effort. I want you and Jerry to realize how resourceful you are. And by resourceful I mean “full of resources.” Each of your possessions is a resource, but beyond that there are lots of other resources as well. When you view your possessions in the context of the full range of resources available to you, you can make decisions about simplifying that will better serve you. This is quite a coincidence, isn’t it? When someone makes the decision to let go of something, it’s because they haven’t used it in a while, and they don’t expect to use it in the near future. So this person went from not using an item for long time to suddenly needing it right away. What’s going on here? I believe that it’s not really about the usefulness of this particular object, but more about the ability of our minds to keep track of our stuff. Let me explain. If you haven’t used something for a long time, you may forget that you own it. If you remember that you own it, you may not remember where it is. If you remember where it is, you may realize that it would be hard for you to get to it. In any case, the awareness of this possession and what it can be used for is going to be buried in the clutter of your consciousness. It’s possible that even if you did have a “need” for this item, the thought would never occur to you. On the other hand, imagine that you are organizing and you encounter this object. You may have a thought like “Look at that. I forgot I owned that,” or “oh, that’s where that is!” Then you spend time considering this object, what it’s used for, how useful it is, how often you use it, and how important it is to you. Finally, you make the decision about whether this item should stay or go. All of these considerations have the effect of bringing this possession to the foreground of your consciousness, so now, when you encounter a situation where this object could be used, it’s much more likely to occur to you. It’s sort of like how after you buy a new car, you notice more of that type of car on the roads. There are not actually more cars of this make and model, you just notice them more. Let’s take a look at an example of this in real life. Remember Bob, who let go of a battery charger but then needed it the next day? If Bob had forgotten that he owned a battery charger, he would’ve probably just made arrangements to charge his battery some other way, like jumpstarting it using a pair of jumper cables and his wife’s car. But since he had just encountered it the day before, he remembered the battery charger, and very reasonably thought that this would be a perfect occasion to use it. Bob may have needed that tool several times in the past five years but didn’t ever use it, but now that it’s fresh in his memory, he regrets not having it. It’s reasonable for Bob to regret not having it, especially since this would be an ideal situation to use it. However, if Bob uses this experience with this one possession in order to justify keeping a lot of stuff that he doesn’t use very often, it’s likely that he won’t be able to actually use that stuff whenever he does have a need for it. I believe that our minds can keep track of a certain number of items, and people who have a lot of stuff, especially if it’s disorganized, tend to lose track of it. 1. Is there another way you can accomplish the same objective? For example, Bob can achieve the same end by jumpstarting his car as he could with the battery charger. When I was a student in France, I had a good friend who was Ukrainian. I still remember him sharing his impressions of America. He told me once that he had heard that in America, there’s a device for everything. “I’ve heard,” he said with outright incredulousness, “there’s even a special tool you can use to scratch your back!” In some sense, my friend was right. We have tools to peel an orange, to peel garlic, to crush garlic, to slice eggs, to cut apples, to hold corn-on-the-cob, and to scratch our backs. If you use these conveniences, that’s great. I’m not saying there’s anything wrong with that. But, although the companies who sell these devices will claim you can’t live without them, you can usually find some other way to do the same thing. 2. If you do need it in the future, how likely is it you will be able to remember, find, and access that tool at that time? Remember that the more stuff you keep because you might use it someday, the less likely you’ll actually be able to use it when needed. 3. If you do need it in the future, how likely is it that it will still be usable? Michael kept a whole box of computer cables, but when he needed them, he realized they no longer were compatible with his current computer. Jerry kept the names of companies he may want to do business with someday, but many of these companies went out of business before he ever called them. 4. Does the benefit you get from something you might use someday justify the cost of keeping it? In “The Hidden Cost of Stuff,” I discuss this question further. 5. For each item that you might use someday, is there someone out there who really needs it right now? If so, the satisfaction you get from donating an item now may be more than the benefit you might get from it someday. 6. If the item is information, is it available via other sources, like a library or over the Internet? 7. If you donate this item, and later discover that you do really need it, how hard would it be to replace it? I would never recommend donating something you think you’re going to need, but for an item you might use someday it may be worth the risk to let go, knowing you can replace it if it does become necessary. There are more and more reuse organizations popping up all around the country. They allow you to combine the benefits of donating and ease of replacement in order to reduce the amount of stuff you need to store for yourself. A client Phyllis is a perfect example of this. Phyllis is an extremely creative artist, a sculptor. When I met her, her studio was full of unusual objects that she thought she might use them some day in an art project. However, her studio was so full of these objects that she had no room left to work. All the stuff she might use someday was keeping her from being creative now. I told Phyllis about a local reuse organization called SCRAP. SCRAP stands for the Scroungers Center for Reusable Art Parts. As the name implies, it’s a huge warehouse full of objects that someone could use in art project. Knowing about SCRAP benefited Phyllis in two ways. First, she was able to all the unusual objects to SCRAP. This gave her more space to work, gave her a tax deduction, and made these objects available to others who could make better use of them than she could. Second, when Phyllis does need something in particular for an art project, she can go to SCRAP and most likely find something at the time she needs it. After all, the selection at SCRAP is much larger than the selection she could keep in her studio. Rather than storing her own warehouse of stuff, Phyllis decided to use SCRAP’s warehouse instead. Creative reuse places, like SCRAP, allow you to change from keeping a bunch of stuff you might use someday to being able to obtain the items you need when you need them. Such resources are now all over the country, and I will talk more about them in a future podcast. Ultimately, at the deepest level, I believe that a reason people keep stuff they might use someday is because they are afraid that when they do need to do something, they will lack the resources they need to accomplish it. I believe this underestimates our resources, and I believe that our best resources are not our possessions, but our creativity, our resourcefulness, our intelligence, and our friends and families. Letting go of objects you might use someday will help you to enjoy, appreciate, and benefit more from what’s important in your life right now. This wraps up our discussion of the phrase “I might use it someday.” Have you ever said, “I don’t like this item, but it was a gift from my dear friend”? The topic of my next post will be simplifying gifts. Until then, make you realize how resourceful you really are. 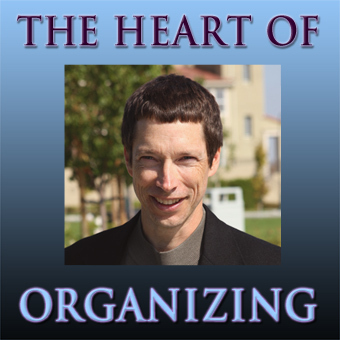 You are currently browsing the The Heart of Organizing: A Blog blog archives for January, 2010.